How about passing on outgrown school uniforms, PE kits and shoes at the Salvation Army on Hunter Lane in Penrith at 10am to 12noon? Or drop off your spare uniforms beforehand at the Op Shop or the Salvation Army shop. If you need something fixed or repaired, come along to the Penrith Repair Cafe which happens on every second Saturday of the month from 10-1 at the Old Fire Station. The next session is from 10am to 1pm on 11th August 2018. 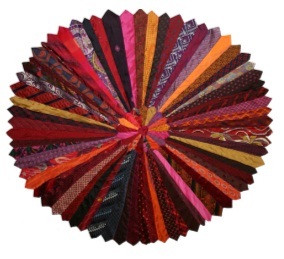 If you've got any spare ties, please drop them off so we can make something exciting with them! The Kirkby Stephen repair café resumes in September and the Alston Moor Repair Café will next be at Nenthead Village Hall on Sunday 23 September, from 10am to 1pm, alongside the Community BIG Breakfast. On Saturday 1st September from 10-12 we'll be at Newbiggin where you hand on stuff you don't need and pick up a freebie - like a jumble sale but everything's free. This is "Stainton" Newbiggin west of Penrith, just off the A66. Thanks for support from the Cumbria Waste Prevention Fund. Our advice is always to stay safe, be nice and be aware of scams. Normally someone will come to pick up the item you are giving away. Eden District is big so it may make environmental and practical sense to meet in town. Small items can be dropped off at the Freegle bookshelf in the Devonshire Arcade in Penrith - but we can't guarantee it will get to the right person. If you'd like to reduce your plastic use, please make some pledges. PACT can then use this data to show businesses and government that they should do more. Freegle volunteer, Chris Cant, has been asked to tell a scrutiny committee of councillors how Freegle helps reduce waste in Cumbria. They want ideas on how we can help keep these materials out of the bin - any suggestions? Cumbria Action for Sustainability Green Build Festival returns in September with a series of visits to environmentally-friendly buildings and a range of other exciting events. Don't forget to add your events to the Freegle Community Events listings - free but a donation to Freegle would always be nice!